Lovely pair of soft leather mens Cowboy Boots by Gringo's. 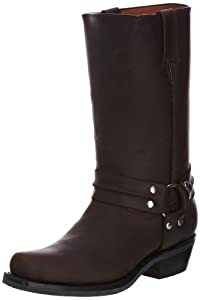 With a medium shaft, slip on inner and out leather these boots are very comfortable with an understated design. They come in Black and Brown 'Crazy Horse leather with a cuban heel , ankle buckle, square toe and Goodyear Welted sole this is a qualty pair of cowboy boots.